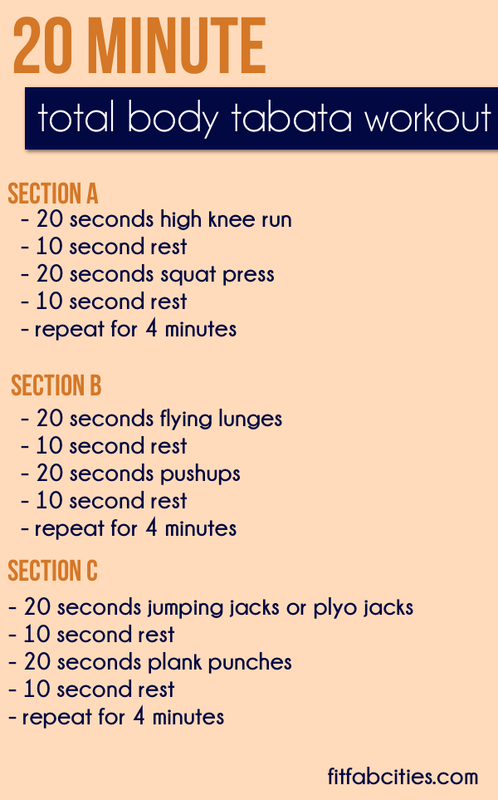 It's a form of HIIT - or high intensity interval training. What is 4 minutes out of your day?! Wake up a little earlier, set out you clothes for the next day so that you have 8 minutes to spare for a HIGH INTENSITY workout! I DO recommend however not just jumping right into it, so add like a 3 - 5 minute warm up and 5 minute cool down stretch, so really at most an 18 minute workout... but STILL, that's not bad at all! And we all have time to spare! Get off the computer! Stop watching TV! So many things take up our days, so why not give a little time to working up a sweet ol' sweat? 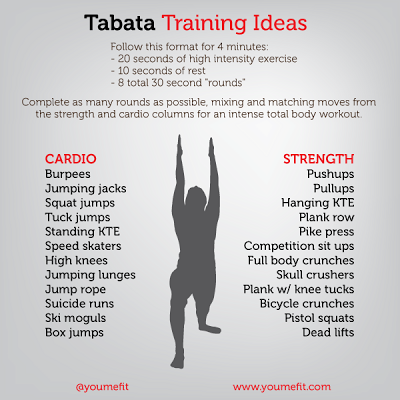 Here are some great TABATA workouts you could try out that I found online! 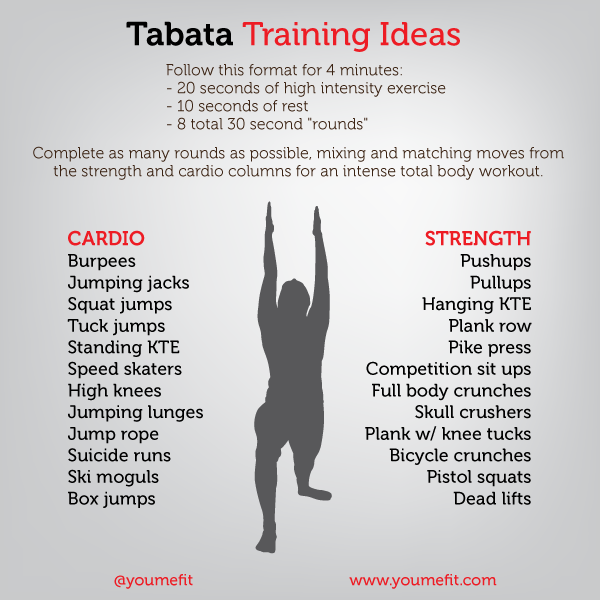 There's also CARDIO tabata, with sprints! That's when you do :20 second sprints with :10 seconds rest - repeat 8 times. Now you don't have to stop at 4 minutes, you could keep going if you wanted to! 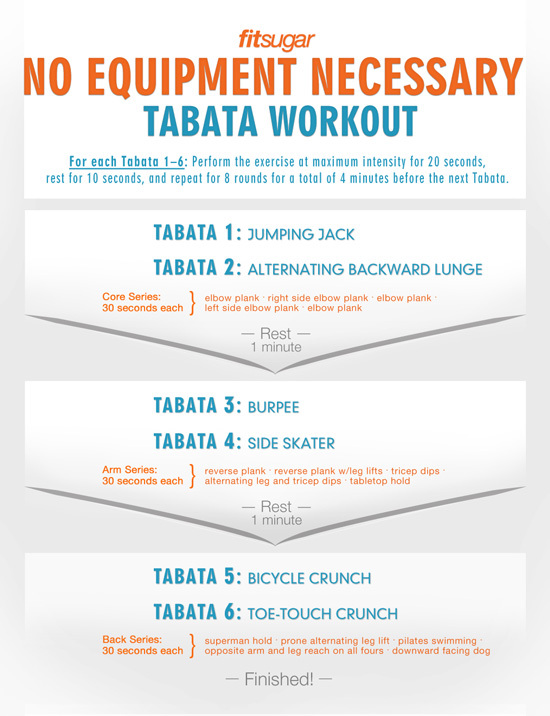 Maybe combine 2 or 3 tabatas for one HECK of a sweaty workout! However long the workout, you know tabata's revving your body up and busting a sweat! AND even if it doesn't show a great calorie burn DURING the workout, you know your body will be burning long after you've stopped your workout!